Yep, sounds good. Feels right. Guess what? 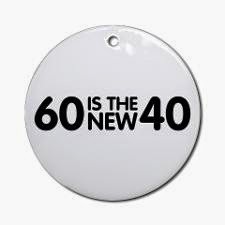 Over the course of the past several years, I've humbly put together several lists the purpose of which is to demonstrate that unlike most Boomers would like to believe, 60 is not the new 40. The most comprehensive of these lists appears in the Huffington Post dated October 1, 2014 entitled (inaccurately) 60 Signs You're Way Past Middle Age. 1) Regardless of whether he or she likes the song Happy, somebody who is 60 thinks Pharrell Williams' hat is stupid. 2) During the years he or she was growing up, somebody who is 40 had heavily impressed upon him or her the critical importance of flossing your teeth, not just brushing. You still don't floss. 3) Somebody who is 60 grew up thinking it was cool that "Davy Crockett kilt him a bar (bear) when he was only three" instead of appalling and disgusting as somebody who is 40 clearly would have. 4) Somebody who is 60 remembers prayer in the schools. Somebody who is 40 only remembers prayer in the schools before the Algebra final. 5) Somebody who is 60 watched My Mother the Car. 6) When somebody who is 40 hears that there was once a TV show called Make Room for Daddy, he or she asks "Make Room for Daddy? Why? Was Daddy big and fat, like Governor Christie?" 7) Somebody who is 60 could easily fill in the following blank: "If you want shoes with lots of pep, get Keds, - - -, Keds." Somebody who is 40 might be able to fill in the blank, but it would have to be a totally lucky guess. 8) Somebody who is 40 might watch The Bachelor, although I hope not. 9) Somebody who is 40 may have a toddler. The only toddler somebody who is 60 has is himself after having one drink too many. 10) Somebody who is 40 would have no way of distinguishing between Jerry Mahoney and Knucklehead Smith. 11) Somebody who is 60 knows precisely how Hertz put you in the driver's seat. 12) Somebody who is 40 does not think Father Knows Best is a television show starring actor Robert Young that somebody who is 60 used to watch long ago but one of the most sexist statements he or she has ever heard in their lives! 13) When somebody who is 40 runs into a friend and tells him he or she is retired, the friend says "That's terrific! How did you do it?!!" When somebody who is 60 runs into a friend and tells him or her he's retired, the friend says "At your age of course you're retired!!" 14) "77 Sunset Strip (snap, snap) ." Okay, somebody who is 40: Explain the (snap, snap). 15)"From out of the blue of the western sky comes Sky King!" Was Sky King the airplane or the pilot in this 50's TV show? A breeze for somebody who is 60. 16) Somebody who is 40 grew up with Sesame Street. 17) If you ask somebody who is 60 and somebody who is 40 to name British Invasion bands, somebody who is 60 could not possibly miss the Dave Clark Five, Freddy and the Dreamers, Gerry and the Pacemakers, Herman's Hermits, Peter and Gordon, and Chad and Jeremy. Somebody who is 40 gotta miss at least one. 19) Somebody who is 60 remembers a time before there was a Super Bowl. 20) Somebody who is 40 doesn't particularly give a crap that James Taylor is bald. 21)Somebody who is 60 remembers the TV spot featuring a hipper-than-hip Robert Lamm of the super group Chicago singing an anti-drug song while his hotter-than-hot girlfriend admiringly gazed at him, while somebody who is 40 wonders why anyone would pay the slightest attention to an anti-drug song by a middling keyboardist from an ancient band that did Saturday in the Park and Does Anybody Know What Time It Is? and a bunch of other songs their Dad likes. 22) When somebody who is 40 gazes into their bathroom mirror, they do not cry out "OMG, this mirrors on the fritz; I've got to get it into the shop for repairs!" 23) When someone mentions the word "turkey" and it isn't Thanksgiving, somebody who is 40 does not immediately begin rapidly hitting their neck with the back of their hand in a vain attempt to smooth it out. 24) Somebody who is 40 is not at all upset by this list. Somebody who is 40 is upset by the list "Another 30 Reasons that 40 is not the new 20," if indeed such a list can be found to exist. 25) Somebody who is 40 grew up with the word "hydrated." 26) You have vivid memories of Dwight David Eisenhower. Wait a minute: nobody has vivid memories of Dwight David Eisenhower! 27) Unlike somebody who is 40 would have, somebody who is 60 didn't blink an eye at the lyrics to the theme to Green Acres "You are my wife!" "Goodbye City Life!" as Eddie Albert yanked Eva Gabor to the country life against her will. 28) Somebody who is 40 thinks J. Fred Muggs was Chairman of the Securities and Exchange Commission in 1957. 30) Somebody who is 60 never talks about memes. This one hit in a number of vulnerable, yet hard to reach areas. Still, though, My Mother the Car rocked. Norm, does my comments section have CATCHA? I don't want it. I thought it was shut off. I always loved it ... wait a minute, it sucked! As addicted to TV in those days as I was, even I didn't watch My Mother the Car. I liked "Love that Bob" for all the women I dreamed I'd one day get but didn't. Thanks, Norm! This is a great blog! Keep up the good work! Who is Beck anyway? Beats hell out of me, I'm a Boomer! I think J. Fred Muggs should be appointed chairman of the Federal Reserve. That position has been lacking in dignity and class for sometime now. As I am on 59 and 4 months, I don't get the whole 60 is the new 40 thing. Probably because I'm still celebrating the 20th anniversary of my 39th birthday 4 months later. It's good to be young. You should try it sometime, Perry. Suddenly 4 months from now you will begin laughing hysterically as you suddenly get each joke. Be ready not to operate heavy machinery or make any major decisions when that happens. I'll have J. Fred Muggs call you to discuss. Meme?? What the hell is a meme?? Like Marcel Marceau. You know. Yes, James Taylor has been bald as long as I've been conscious of him. My generation remembers Chicago as the band who sound-tracked the Karate Kid. Can't Stand Pharrell Williams. I think you have to 14 to get him. You got me on the British invasion. I would have guessed Stones and Beatles and maybe Spinal Tap. I assumed Beck's first name was Jeff. You nailed the "hydrated" thing and just about everything else. One possible addition I could offer came from my grandfather: "When I was a kid there was no such thing as food that wasn't good for you. Ya either ate or went hungry." This from the guy who ate lard sandwiches, whole eggs and real butter and somehow lived to 87. Anyway, great list. Made me laugh. As a 60+ year old woman who feels like a 40 year old inside, I plead the 5th! But, suffice it to say, the subtitle of your article above is 100% correct! I FEEL it, but no one over 35 gets it. Thanks, Ben! Just saw your comment now. Please stay hydrated and keep digging that Beck, Bogert, & Appice. We are all 35 inside. How to get the outside to match up with that is the problem!